After breakfast, it is time to move on and see some sights. Turning South, you will soon see the beautiful Vinohrady Water Tower from 1882 next to the Bezrucovy sady park. Walk past it to get to the first marvel of modern architecture amongst the Art Deco Vinohrady houses: the Husuv sbor church. Completed in 1935, Husuv sbor is one of the most important Constructivist buildings in Prague. It is dominated by the bell tower with three bells and the chalice, the symbol of the Hussites, at the very top. If you get to see the inside (we can’t guarantee it), have a look at the roof, made of industrial skylights. Walking down to the bottom of the park, turn left to the Hradesinska street to have a peek at the villa of Mr Kotera, one of the leading Czech architects of the early 20th Century. The villa was built in 1908 based on the architect’s own design. Walking down the stairs at the bottom of the park reveals the third great building of this itinerary: Saloun’s villa. The villa was completed in 1911 as a studio for Mr Saloun, a famous Czech sculptor, to finish the design of the Jan Hus statue that today dominates Old Town’s Square. Now it is used by the Academy of Fine Arts as a studio for visiting artists. Having seen the sights, it is time for coffee. Continue past Saloun’s villa to get to Coffee House at Francouzska street, the home café of the Coffee Source roasters. It may not look like much but the café has two things going for it: great coffee, and its backyard, one of the calmest and quietest places to have good coffee in Prague far from the madding crowds. Walking up the Francouzska street gives you the opportunity to have something sweet at Café Slagr. We like this cafe for its old-charm atmosphere rather than the humongous cakes they serve but it is nice to visit, anyway. Go back a little and you will enter Boho Vintage Concept Store, a kingdom of cool vintage clothes and assorted accessories. We could spend hours in this shop so be careful! You were warned. 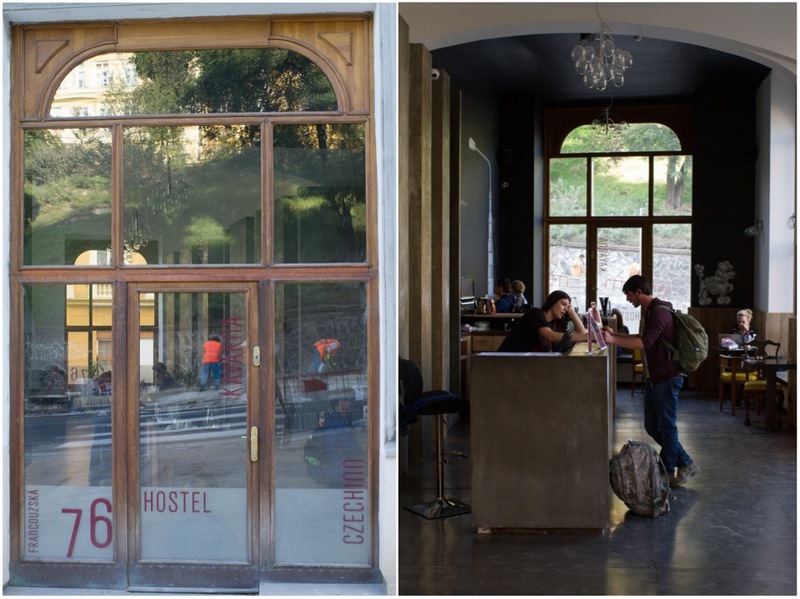 If you walk down and take the first right from Boho, you will pass Czech Inn, a hip local hostel that nicely blends into the bohemian surroundings, and enter the hipster heaven that is the Krymska street. Known for its communal spirit, playful street parties and outdoor events and a bohemian lifestyle, Krymska has gained quite a reputation. Its repute is really disproportionate to the size. Krymska is a tiny sloped street that still manages to accommodate some very interesting places. We like the bookstore by Baobab, which publishes artsy books for children and adults alike, Café v lese, a popular café, bar and club, Plevel, a vegan restaurant, or Strojovna, a small room where public sewing and knitting classes are held. We may not be fans of all the shops and cafés in the street but you cannot deny the street has a charming, run-down atmosphere and works as a self-contained unit. By this time, you will surely be thirsty, so it’s time to have a drink. To have some good, local beers (made in Unetice, a small brewery on the outskirts of Prague, or by Jezek, a Jihlava-based brewery), visit Cafe Sladkovky in the Sevastopolska street one street down from Krymska. They also hold many art exhibitions and organize artsy events. If beer is not your thing and you prefer wine instead, we have some very good news for you. Just a few steps from the Krymska street, you can marvel at the beauty of the Havlickovy sady park and the Grebovka vineyard, a tiny remnant of the former winemaking glory of Prague. Despite the size, the vines produce eight different grapes, many of those offered by glass in the local wine cellar. Even if you do not like wine, the park and the vineyard are a beautiful place with great views of the southern parts of the city. On a sunny day, just sit on a bench and enjoy the moment, with or without a glass of wine in hand. Now here’s a detour especially for Australians visiting Prague: the Bohemians 1905 football (soccer) stadium. There are four main football teams in Prague, but only one of them was on a tour of Australia in 1927, received two live kangaroos as a gift and on arrival changed their name to “Bohemians” (as they were called on the tour) and changed their mascot to the kangaroo. The Bohemians are a club with a devoted following and a great, local atmosphere. For listings and schedules of play, visit their website. From the stadium, walk up again and turn right when you reach the tram tracks. After two blocks, you will reach St Wenceslas Church, one of the best functionalist buildings in the entire Czech Republic. It was completed in 1930 and designed by famous architects Gocar and Wachsmann. The church dominates the Cechovo namesti square and still amazes with its simple beauty. But by now you have to be hungry. To have some really good coffee and some really good cake, we recommend a stop at Café Jen at Kodanska street. We have interviewed the owners, Dominika and Hanka, on this blog a while ago. It is a place we keep coming back for its homey atmosphere, caring staff and good coffee and food. The atmosphere here is so nice we could stay for hours and just read a book or reflect on the day just past. We think every good itinerary should end with a great meal. For this particular one, we have two suggestions. If you had just about enough of walking and want to rest your tired bones and have some nice, rich, Italian comfort food, there is no better place nearby than Osteria Da Clara. It is run by an English chef in love with Tuscan food and is a local favorite. If you still have the energy to walk up the hill to the Vinohrady district where the itinerary started, we recommend Ola Kala. It is a restaurant that not so many people know about and that we would recommend any time for a great meal to finish the day or the walk.